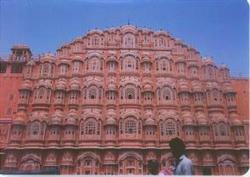 Julie Ferwerda's website | India 10: Jaipur Fortress & Elephant rides! 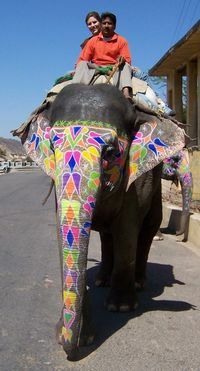 India 10: Jaipur Fortress & Elephant rides! On our way from Agra to Jaipur, Sam stopped at a little road stop where there were some unique handmade authentic Indian items. Maria and I went in and bartered down some goods and came out to get into the car where Sam was waiting (he'd given us instructions on what to pay and how to barter and then he waited outside). Just then, two men came out and began talking animatedly to Sam and pointing at us. I was thinking, "Oh great…I wonder what we did wrong." When Sam got into the car, he told us that the man from the store had looked out and recognized Sam with us and, even though Maria and I had bartered down to half prices from the original, the man came and gave us 1500 rupees back (about $40)! That was more than 20% of our total purchase! That is probably unheard of in India, for men to follow you out to your car to give you money back, but they love and respect Sam so much here, that they did it voluntarily. We did not accept the money from the man though. We asked him to put it to good use for orphans. As we got closer to Jaipur, the landscape went from lush green and full of trees, to more of a Rock Springs, Wyoming feel—deserty and dry. 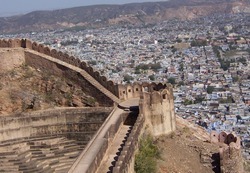 The city of Jaipur, founded in 1727 by one of the greatest rulers of the Kachhawaha clan, the astronomer king Sawai Jai Singh, is also called the "Pink City" because some of it is constructed out of pink sandstone and large sections of town (literally miles) were fabricated to match. The historic building in town have sort of a medieval flare, and there are also many fortresses built into the steep hillsides (borderline mountains) overlooking the city of 17 million! You can imagine the traffic mid-day because it is a very dense city in a valley. If you plan an outing, add a couple hours for traffic. When we pulled into town, Sam took us on his favorite "motorcycle road," a steep, windy, narrow road, to the top of a mountain where there is an ancient fort. It was so awesome to see. There was a large stone gate, chariot roads built by hand out of flat rocks, a concubine bathing area that looked like a little amphitheatre cut into the pink stones with a pool. Of course things haven't changed much since King David's day; the king could sit and watch the women bathing from his room. The fort walls had little holes in the top of the stone for the defenders to put their weapons (arrows?) through while being protected behind the rock. Anyhow, the view of the city was breathtaking from up there. Looking down in the valley, you could see a giant lake with one of the king's building's in the middle, I think Sam called it a "water palace." There is a large dam to hold the water, and even though it is very low now, it fills up during monsoon season (July/August). Can you guess what is the color of the dam? So, about the elephant ride! Yep. We were each able to sit upon our own elephants for a good ride and then, even to Sam's shock and amazement, the elephants bowed down to let us off. He told us when we got back in the vehicle that no one usually gets to ride their own elephant and he has almost never seen them bow before. So, I think we have had a pretty amazing experience! We checked into our hotel, and Sam assigned us a tour guide for the day, Trevor. He is an Emmanuel/Hopegiver's pastor here in Jaipur and also runs a school and orphanage. Trevor's assignment was to take us shopping downtown for the afternoon, and to get us some good deals. Mission accomplished! First we went into a shoe store where they sell hand made shoes (they make them right there while you watch). Between the two of us, we got five pairs of shoes, all leather and some of them hand beaded, for a whopping total of…$30!! Can you imagine? Next we went to look at jewelry and found some lovely deals but I won't give away too much in case they end up on some of you. Lastly, we shopped for some skirts to wear as we will be visiting at least three orphanages on our way to Kota, and Sam wanted us to look sharp. We found some beautiful hand-stitched skirts and shirts. It's hard to believe the work that goes into these things. The skirts and shirts are full of embroidery and stitching and we got them for dirt cheap! Trevor was a wonderful guide. He's one of Emmanuel success stories (like most of them). He was one of the very first orphans to come into the ministry (he also graduated from Emmanuel Bible College) and he told us his testimony. He has such a heart for the Lord and a beautiful story. One thing that really struck me is that he cannot stop talking about what Sam and M.A. mean to him (Sam probably paid him off to say it all). He told us today that he never has to worry about clothes because every time Sam comes to see him, he gives him his own clothes. He pointed to his shirt and said, "For example, this shirt is a brand new shirt and Sam gave it to me. These shoes (nice leather shoes) he gave me, and even my socks. Sam always gives me his best clothes before I even ask, and so I never need anything." If I wasn't mistaken, I think I saw a tear or two welling up in his eyes as he recounted the ways Sam builds him up and gives his very best to him. I was very touched by Trevor's gratitude and love for Sam. In the last year, Trevor told us about the many times he has been beaten and threatened during the Emmanuel persecution. He said at first he was terrified and paralyzed from it because he never knew what they were going to do to him. He said at one point, the church was circled by 300 angry men and he had to walk outside to get to his car. They came after him but he was able to escape. He said that in the last year, he has worked through the fear, and now is no longer afraid. This speaks to my own fear of persecution, as I could feel his justified fear as he described it. But then he told me that it's strange because, when you get beaten a few times, you lose your fear. And now he is not afraid. Wow. for ten years. But now he actually feels glad they are gone because he has learned who is sincere in their commitment to Christ. Now Trevor says he has taken the martyr's oath and he is ready to die for his faith if that's what it takes. It was all very moving as he shared his inner struggles through these mental battles, and I felt honored that he would open up with us. I definitely wanted to make a small message to thank you for some of the great recommendations you are writing on this website. My considerable internet search has at the end of the day been recognized with sensible content to share with my great friends. I would assume that we website visitors are undeniably fortunate to be in a useful site with many lovely individuals with interesting guidelines. I feel very lucky to have encountered the site and look forward to plenty of more excellent moments reading here. Thanks once again for everything. good website… I learned a lot from it. thanks admin. Original content material like this can be tricky to find in recent times. . !